The basics are clear: The Ebola virus transmits from symptomatic patients and not in the incubation period (2-21 days). The first symptoms – fever, weakness, myalgia and headache – occur also in malaria, typhoid fever and other common diseases so laboratory confirmation of the diagnosis is essential. The patients’ body fluids, such as blood, saliva, urine and faeces, harbours the virus, and transmission may occur when these fluids hit mucous membranes or broken skin of other persons through splashes, direct contact or via objects. All previous Ebola epidemics have been stopped using two well-known public health measures: isolation and quarantine. Isolation: Sick patients must be identified and brought safely to nearby treatment centres, get a diagnosis and, if they have Ebola disease, be isolated and treated by personnel who protect themselves with gloves, masks, goggles and gowns. Suspected Ebola patients who die at home must also be handled by personnel with this kind of personal protective equipment. The point is to get patients out of the home where their family members are at high risk of infection during nursing and possible later burial. Quarantine: Individuals, who may have been infected by the patient, must be traced and then followed up for three weeks until it is clear whether they have been infected or not. If they develop symptoms, they must be isolated and tested. During the three week follow up period they can stay at home (home quarantine) or be admitted to closed quarantine sites. These measures are only possible if the population trusts the health care services. They must bring their sick to the treatment centres for isolation, and the contacts must accept follow up and possibly quarantine. This trust is not uniformly present in Guinea, Liberia and Sierra Leone. After many years of war or dictatorship, people have no unreserved trust in the government. Less than half of the population can read, «witch doctors» have great influence, and false rumours spread easily. It’s a vicious circle. Prevention is dependent on separating the sick from the uninfected. To convince the sick to admit themselves, the treatment centres need to offer a better shot at survival than the patients will have at home. Currently, some treatment centres – if they have available beds at all – offers little more than a lonely death. Thus, patients stay at home where their family members are put at risk. This in turn leads to more infected people and even more overwhelmed treatment centres which are then even less capable of offering nursing, comfort and life-saving treatment. Since March, Doctors Without Borders have warned that this Ebola outbreak is different. The local authorities lacked the will or the capacity to respond forcefully to the unfolding epidemic. The affected countries are among the world’s poorest, and they have only rudimentary health care systems with very few doctors and nurses. Infected individuals brought, unknowingly, the virus to more densely populated areas, across borders and to the large urban centres. The WHO and the Western countries also reacted too late. Only on September 18 did the UN Security Council adopt Resolution 2177 that asks the Member States to reopen their borders with the affected countries and bring in more resources. There is an urgent need for tens of new treatment centres (in churches, schools or stadiums if necessary), each with hundreds of personnel with personal protective equipment, laboratories that can pick out the Ebola sufferers from all febrile patients, and mobile teams that can inform the population, find patients and follow up contacts in home quarantine. Treatment centres are being built now, but no one knows where the staff will come from. USA, EU, India and China should immediately start recruiting thousands of health care workers. This Ebola epidemic is no longer only an epidemic that may affect hundreds of thousands of West Africans. It is also an economic crisis and a potential security crisis. The health services have collapsed, exports have stopped, and agriculture is suffering. Food prices are increasing, some people are already starving, and the countries are threatened by an economic collapse. Civil unrest may result. Even if this epidemic is different, the virus is the same. The reservoir of Ebola virus is probably some species of African bats, which do not become sick. Once in a while, like in a village in Guinea some time in December 2013, an accident happens that gives the virus the opportunity to jump to another mammal or directly to a human, for instance through eating of fruit contaminated with bat body fluids. Humans can also be infected during capture or slaughter of bats, monkeys, apes or rodents, so called bush meat, which is an important source of protein in several African countries. Viruses are small and bad copy machines. The replicate their genes, but with errors (mutations). New virus variants may replace the old one if they have new features that improve their ability to spread. Now the Ebola virus is in a new, foreign environment – the human body. We may speculate that virus variants that transmit more easily between humans will have advantages and after some time dominate. An Ebola virus variant that gives milder symptoms may lead to patients who are able to keep going and infecting more people before they are immobilised themselves by the disease. In that scenario, the accident in Guinea in December may be the start of the permanent establishment of the Ebola virus among humans, just like an accident in Cameroon sometime around 1920 was the start of the AIDS pandemic. Then, HIV jumped from a chimpanzee to a human, probably during slaughtering. 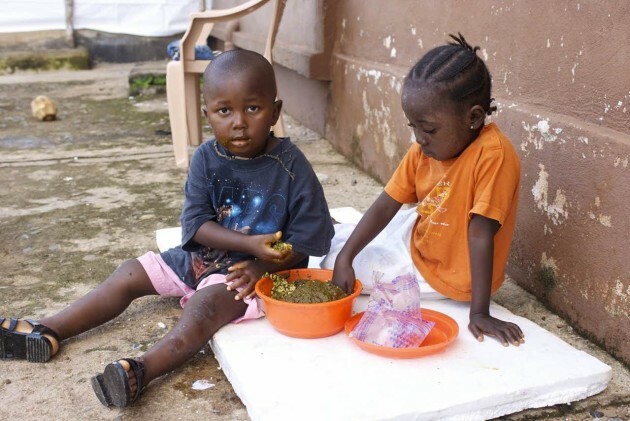 The photo shows two Guinean children orphaned by the Epola epidemic. © Copyright World Health Organization (WHO), 2014. All Rights Reserved.